Identify the students teams as consultants. Make the students aware of the role of a consultant and the importance of addressing the needs of the client. Work with the teacher facilitators to frame the problem in ways that relate to the students and allow teams to work collaboratively. Bring in experts from Day 1. We have each kick-off event at the EIC. Bob Meeder, the CEO of the EIC, arranges for a team of experts, or as he calls them “bosses,” to work with the student consulting teams. Frame the challenge around a Request for Proposal (RFP). In the business world RFPs are the documents that outline the expectations of the client. The consulting team has to address the project based on the client’s needs. 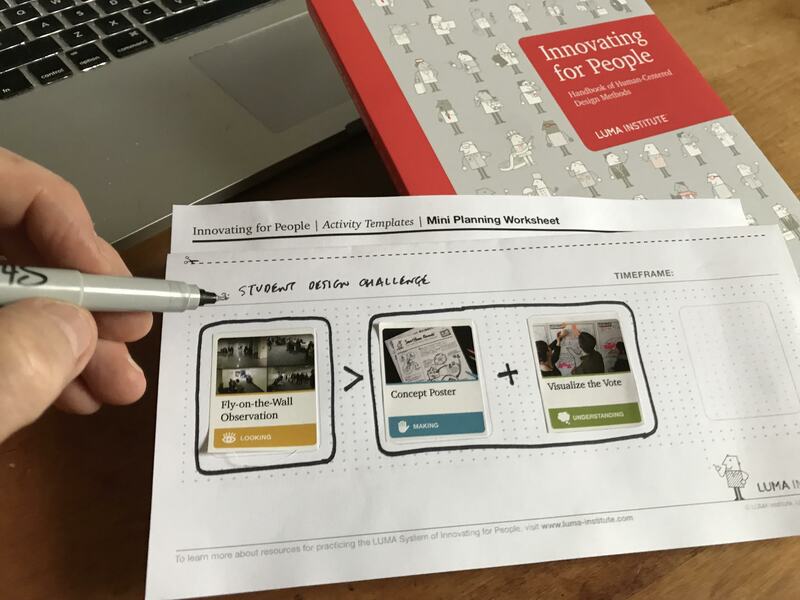 Use a human-centered design process to move the project along. I’ve had an opportunity to undergo training through the LUMA Institute. The LUMA framework, developed through a meta-analysis of the best strategies in design thinking, helps to shape the problem more succinctly and provides the focus on the target population. For this year’s two Design Challenges I used a LUMA recipe – a combination of strategies – at the midpoint session. 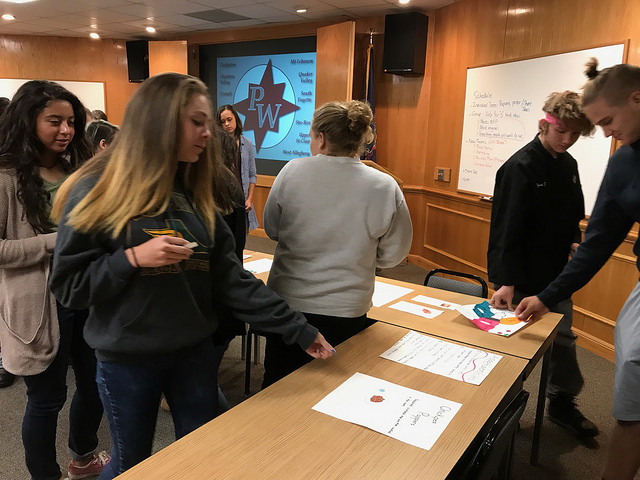 For a Food Menu Item Design Challenge where the student consultants from South Fayette, Carlynton, and PWCTC had to come up with their best ideas for the forthcoming EIC Healthy Cafe, I needed a way to identify the best choices. 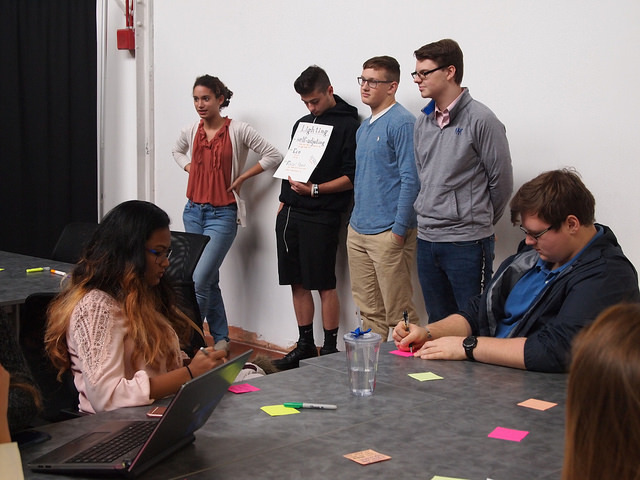 Each student consultant created what LUMA calls a “Concept Poster” for their food item and then had to pitch the idea to their colleagues and a team of experts that included people in the food industries. Each consultant and expert then chose the three best ideas and put dots on the Concept Poster – LUMA’s “Visualizing the Vote.” This combination of strategies narrowed the choices, but there was an issue – could the choices work in a cafe environment in a cost-effective manner? Fortunately, I had a team of student experts who were studying Culinary Arts and their teacher, a chef from the Parkway West Career and Technology Center. The chef with the student consultants then examined the top choices that would be prototyped in the PWCTC kitchens. The second Design Challenge focused on the renovation of an existing space – Innovation Hall- at the EIC. The student consultant teams from Keystone Oaks and Chartiers Valley worked in four teams – lighting technologies, smart technologies, surface technologies, and furnishings. At the midpoint each team developed a “Concept Poster” and then each consultant and expert working on the project responded by placing a red note for a Great Idea, a green note for a promising idea that needed some further thinking, or a brown note for an idea that might not work. LUMA calls this strategy “Rose, Thorn, Bud.” Once the teams received the feedback from the other teams and experts, they had to revise their plan. In both Design Challenges the LUMA strategies provided great ways to get all students involved in a collaborative manner. The consulting teams had to use communication skills that included visualizing ideas. The teams had to analyze feedback and revise (iterate) their ideas. We’re not done yet. The final presentations will take place in the next month, but one of the Design Challenges from last year will soon have a ribbon-cutting ceremony. What’s better than having the student consultants actually see their ideas implemented? Last year three teams of students worked on the installation of a windmill at the EIC. Consultants from Carlynton High School came up with a very original model using a Hummingbird Kit from Birdbrain Technologies. 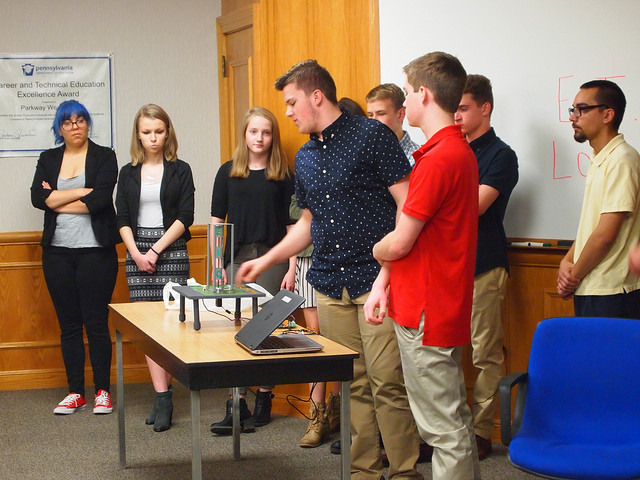 A second team from PWCTC’s Electrical Studies program devised a storage and power strategy for the RFP, while the third team from West Allegheny developed an educational strategy to instruct visitors at the EIC about wind energy and sustainable energies. In December members from the original Design Team will join Windstax Technologies, key members of the EIC, the mayor of Pittsburgh, and the County Executive of Allegheny County in a ribbon cutting ceremony – a great real world celebration for a challenging real world problem.